Zanen Theodoric the Great a karni na 12th, Sarkin Ostrogoths. 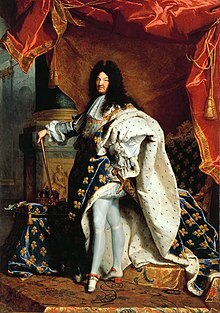 Louis XIV na Faransa, "Sun King" (Roi-Soleil), Wanda yayi mulki French absolutism (Zane daga Hyacinthe Rigaud 1701). Sarki, ko Sarauta itace lakabin da ake ba mai-sarauta namiji monarch a kasashen Hausawa ko a inda ake amfani da harshen, acikin yanayi da dama. Lakabin ga mace, itace Sarauniya ko Saraniya na kan-karaga, sai dai akwai wasu wuraren dake kiran masu irin wannan mulki da suna na daban, kamar a kasar Poland Jadwiga na Poland da kuma Mary, Sarauniyar Hungary, wadanda aka nadasu Sarki a Poland da Sarki a Hungary atare a 1380. sai dai lakabin sarauniya karan-kansa yafi nufin [[Matar Sarki|matan] Sarki ne. A amfani da sunan a zamanin da suka shude, antiquity and contemporary indigenous peoples, lakabin na nufi ne ga Sarautan Kabila. Kamar sarautar Jamus na dai-dai tareda al'adun Indiya da Turai na shugaban cin kabilu (c.f. Indic rājan, Gothic reiks, da tsohuwar Irish rí, da sauransu.). A kuma cikin amfani da sunan ga classical antiquity, Sarki ana fassara shi a harshen Latin da rex da a harshen Girka archon ko basileus. A kuma classical European feudalism, lakabin Sarki amatsayin sa na mai mulkin Daula an yarda shine mafi girman matsayi a tsarin feudal, wanda ake lakaba wa emperor (harking back to the client kings of the Roman Empire). In a modern context, the title may refer to the ruler of one of a number of modern monarchies (either absolute or constitutional). Lakabin Sarki ana amfani dashi tareda wasu lakabobi ga monarchs: a Yamma, prince, emperor, archduke, duke ko grand duke, da kuma a Gabas ta Tsakiya, sultan ko emir, etc. Kalmar Sarki na kuma daukan ma'anar Matar Sarki, lakabin da akewa mijin Sarauniya mai-mulki, amma lakabin matar yarima ake amfani dashi a wasu lokutan. A king dowager is the male equivalent of the queen dowager. Mahaifin Sarki shine dowager na sarkin wanda kuma shine mahaifin mai-sarautan dake mulki. ↑ The notion of a king being below an emperor in the feudal order, just as a duke is the rank below a king, is more theoretical than historical. 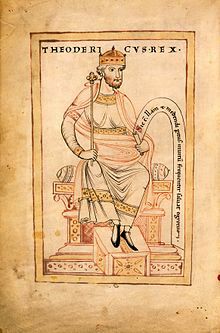 The only kingdom title held within the Holy Roman Empire was the Kingdom of Bohemia, with the Kingdoms of Germany, Italy and Burgundy/Arles being nominal realms. The titles of King of the Germans and King of the Romans were non-landed titles held by the Emperor-elect (sometimes during the lifetime of the previous Emperor, sometimes not), although there were anti-Kings at various points; Arles and Italy were either held directly by the Emperor or not at all. The Austrian and Austro-Hungarian Empires technically contained various Kingdoms (Hungary, Bohemia, Dalmatia, Illyria, Lombardy–Venetia and Galicia and Lodomeria, as well as the Kingdoms of Croatia and Slavonia which were themselves subordinate titles to the Hungarian Kingdom and which were merged as Croatia-Slavonia in 1868), but the Emperor and the King were the same person. The Russian Empire did not include any kingdoms. The short-lived First French Empire (1804–1814/5) did include a number of client kingdoms under Napoleon I, such as the Kingdom of Italy, the Kingdom of Westphalia, the Kingdom of Etruria, the Kingdom of Württemberg, the Kingdom of Bavaria, the Kingdom of Saxony and the Kingdom of Holland. The German Empire (1871-1918) included the Kingdoms of Prussia, Bavaria, Württemberg and Saxony, with the Prussian King also holding the Imperial title. ↑ Pine, L.G. (1992). Titles: How the King became His Majesty. New York: Barnes & Noble. p. 86. ISBN 978-1-56619-085-5. Anyi gyaran ƙarshe na wannan shafi a ranar 1 ga Afirilu, 2019, da ƙarfe 12:01.